Many of us look at December 31st as a reboot button in the game of life. January 1st is a start over. I encourage your innovation team to do the same. Put all projects away and start over with a clean mindset. Often times we get so engrossed in an assignment that we lose sight of the innovation’s purpose, or worse, it never even had a purpose and it was just a task someone higher up in the chain of command thought might be good idea. But for what? The report explains that today’s consumers want “real food,” and while one singular definition of real food does not exist, for many, real means existing, not imitation. Real food then is a food that’s as close to its natural state as possible. Dairy foods are the real deal. It’s imperative that your innovation efforts keep it real and that this gets communicated to shoppers, especially “potential” dairy superconsumers. 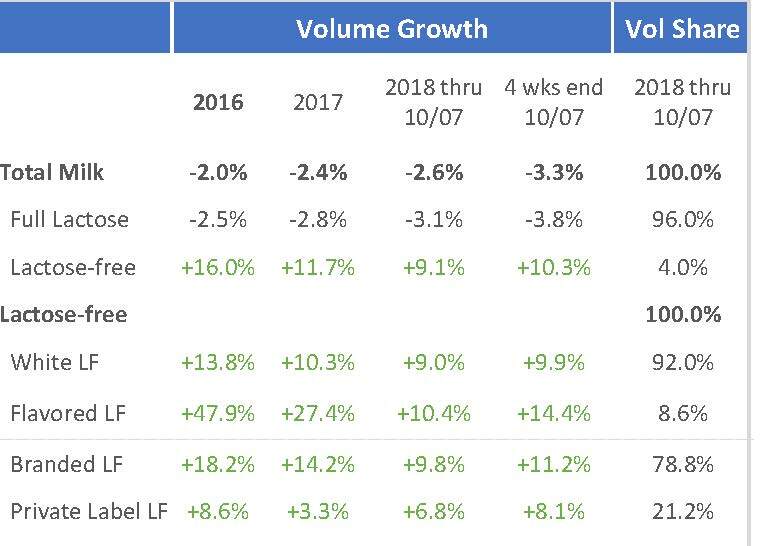 “Potential” dairy superconsumers are the biggest opportunity for growth. They shop the dairy case and have the potential to buy more when they are attracted to the product. Hit reboot: Face it. Haters are going to hate. You are not going to convert a dairy hater into a dairy consumer. Hit reboot: Dairy lovers, a.k.a., dairy superconsumers, are already passionate about dairy products. They are heavy users and highly involved. You do not need to innovate to keep them buying dairy foods. Hit reboot: Let me introduce you to one-out-of-five households. These are the “potential” dairy superconsumers. Your future innovations should talk to their needs and wants. Photo source: Dairy Management Inc. In 2017, IDDBA commissioned The Cambridge Group to explore superconsumer opportunities. The research found that dairy superconsumers represent 10% of households and drive 22% of the total dairy spend. The more important finding is that 20% of households are “potential” dairy superconsumers, people who often really like dairy, but spend less than a dairy superconsumer (about $311 per year versus $634). Potentials may need to be taught or given permission to use more of a product. Permission comes in the form of targeted innovation. According to IDDBA, the teaching angle may be as simple as getting back to the basics, such as pushing the positive nutritional qualities of dairy by amplifying the marketing message that dairy is full of calcium, protein and other healthy vitamins. A number of dairy experts interviewed by IDDBA indicated that they believe the dairy industry has moved away from touting the natural benefits—including the “realness”--of products made from milk and that consumers are hearing inconsistency in the messaging. Dairy superconsumers have clearly retained the messaging that other consumers have lost. Emphasizing these messages may get potentials to increase their dairy spend, which would directly result in an increase in category growth. So where are the innovation opportunities to turn the “potentials” into full-fledged dairy superconsumers? Well, I can tell you it’s not in white milk, unless it’s value-added, and possibly full fat. 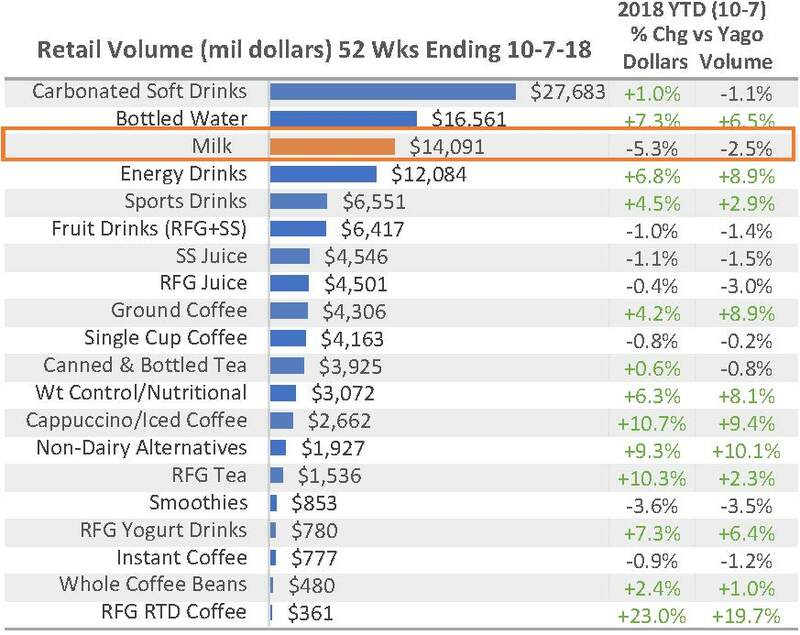 Data from IRI provided to Dairy Management Inc., and courtesy of the Midwest Dairy Association, show that total retail milk volume sales were down 2.6% for the 52-weeks ending Oct. 7, 2018. 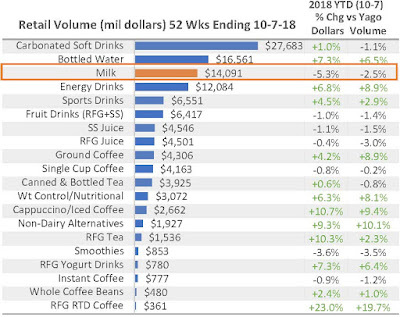 Milk sales are also declining at a faster pace than other beverages; however, coffee-milk beverages and yogurt drinks are bright spots. 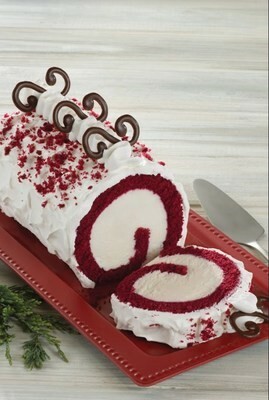 Both may contain milk, dairy ingredients and dairy proteins. 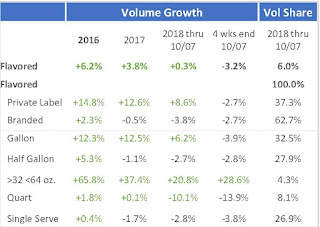 Overall, whole milk continues to be a growth segment. 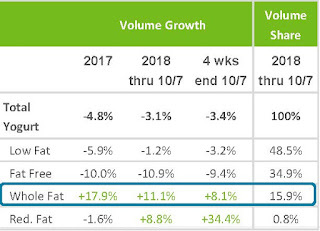 It is now the largest fat level variety with 38% volume share of total retail milk, up from 29% in 2013. 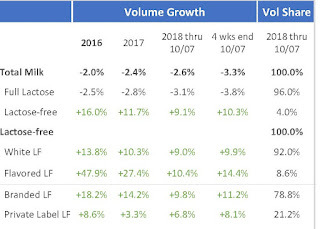 Whole milk’s growth in 2018, however, has moderated from 2016 to 2017. 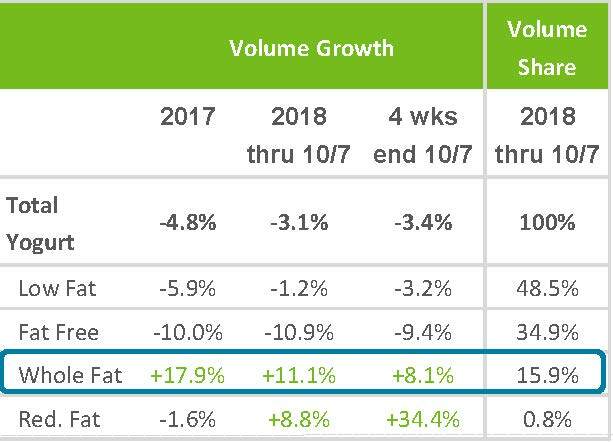 Flavored milk also continues to be a bright spot for the fluid category; however, for the 52 weeks ending Oct. 7, 2018, volume was fairly flat compared to the previous 52-week period. A key opportunity here is to go lactose free, and then either boost nutritional profiles or make it indulgent. 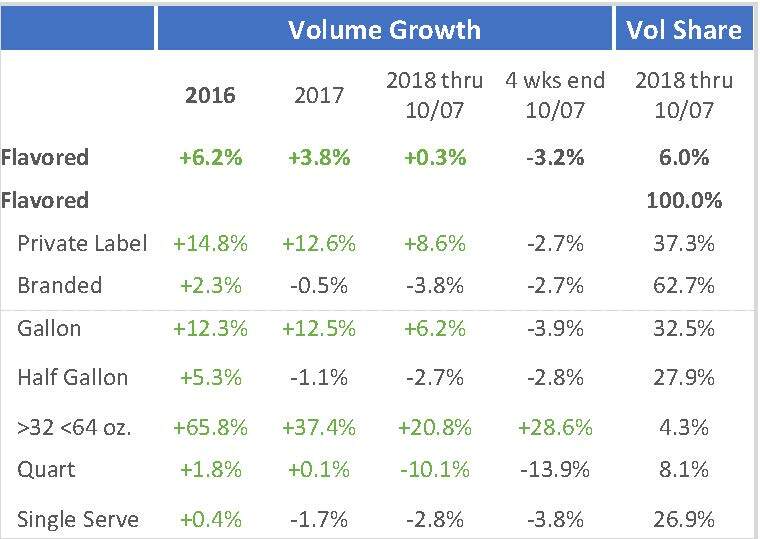 Yogurt continues to decline in retail sales; however, the declines are more moderate than in 2017. 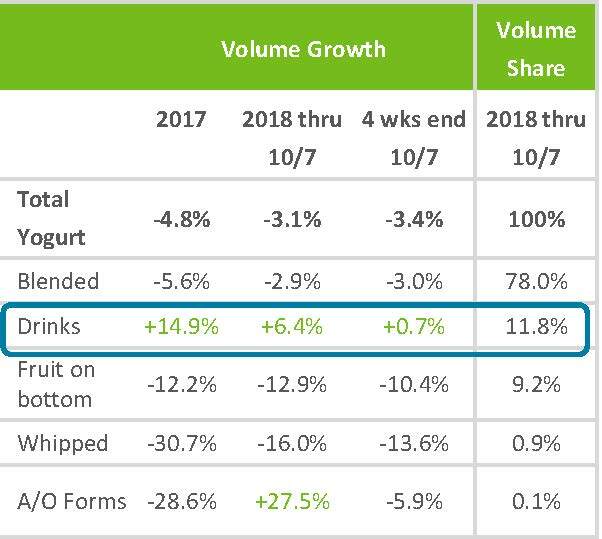 The yogurt segments showing growth speak to key consumer trends, namely convenience, protein and real food, with the latter including fruits/inclusions with less sugar and more wholeness. 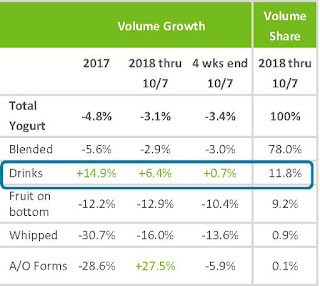 Convenience is helping drive the growth in yogurt drinks, while continued growth for whole-fat yogurt is also associated with consumers’ ongoing desire for whole, natural foods. That’s why cheese remains central to consumer enjoyment, offering a compelling way for the category to engage consumers in this age of increased interest in plant-based eating. Cheese also speaks to those three key consumer trends: convenience, protein and real food. One of the biggest opportunities in cheese is ethnic cheeses, namely authentic Hispanic cheeses. The IDDBA research emphasizes that there’s this misconception that all shoppers are looking for cheap milk, as well as other low-priced dairy foods. This is not the case. Shoppers find value in quality and will pay for it. Remember, “potentials” may need to be taught or given permission to use more of a product. Hit reboot December 31st. Target your innovation and never devalue your efforts through low pricing. In order to help me best serve the industry, please spare five minutes to answer a quick seven-question survey about your experience with Daily Dose of Dairy/BerryOnDairy.com. For every survey completed, I will donate 50 cents to The Great American Milk Drive. Please link HERE to the survey. About The Great American Milk Drive: Each year, 46 million people, including 12 million children, rely on Feeding America food banks for regular access to milk, which is one of the most-requested, but least-donated, items. On average, these food banks are only able to provide the equivalent of less than one gallon of milk per person per year. The Great American Milk Drive was created to help address this specific need, and is the first-of-its-kind national program. By completing this brief survey (link HERE), you will assist with providing more hungry families with fresh U.S. milk. Your feedback in the survey will also assist me with improving Daily Dose of Dairy/BerryOnDairy.com in 2019. I will share survey results with sponsors for them to better understand how their support and investment is appreciated by the industry.